Around my house we eat a lot of rice. Anything that is normally serviced with pasta instead goes with rice. 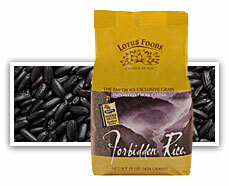 But as much rice as I eat, I was surprised about all the varieties that Lotus Foods carries that I have never heard of. And One 2 Try is giving you the opportunity to win a variety pack from Lotus Foods.